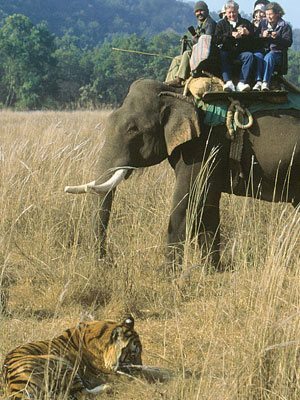 Bijrani Tourist Zone is a very popular area of the spectacular Corbett Tiger Reserve. This zone is enriched with a huge number of floral and faunal species. 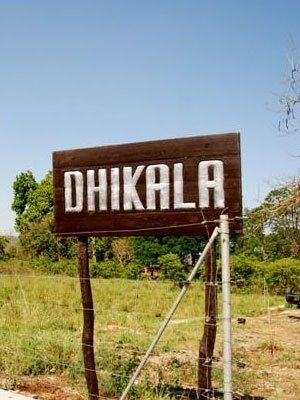 Bijrani gives a tough competition to Dhikala zone while the tourist's preferences are concerned. The zone is known for its wonderful landscape and is very calm and quite place. The beauty of this place is appreciated by all the visitors. This is one of the most tiger rich areas of the park.Bijrani consists of a mixed topography with dense Sal forests combined with grasslands. The entry to this zone is through Aamdanda Gate. With in Bijrani Zone, Forest rest houses are located in Bijrani and Malani. The rest house at Bijrani has six rooms (Four with double beds and two with single bed) and dormitory consisting of four beds. The compound has its own restaurant and canteen. Elephant rides into the jungle are available from here. The region is frequented by wild animals and birds unperturbed by the human interventions. The chances of spotting a tiger, Sloth bear and herd of elephants are quite high in this part of the park. The rest house in Malani has two rooms (Double bed) and is very popular among bird watchers and tourist seeking a peaceful place. The picturesque beauty of Bijrani is magnificent. 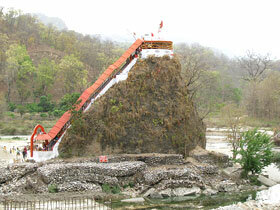 It is endowed with wide grass lands, thick forests and huge water drains and inspiring count of flora and fauna. 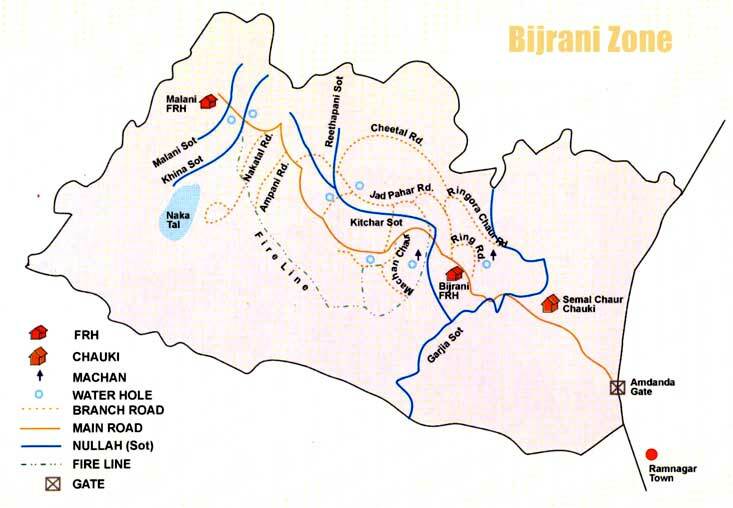 Bijrani safari zone is highly endowed with rich diversity of flora and fauna. Bijrani zone, situated at a suitable distance from Ramnagar is the most preferred zone for Wildlife enthusiasts visiting the park for day visit. It gives its visitors a wonderful experience of the beautiful forests. The compound has its own restaurant and canteen, where buffet meals are served with a variety of good quality food at affordable price. BIJRANI(FRH) Malani Forest Rest House was built in 1930's and is located at the edge of the core zone of the Corbett National Park approximately12km northwest of Bijrani. 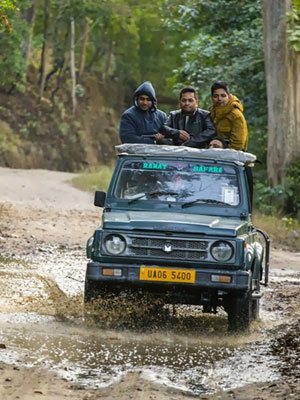 From Bijrani driving through the Machaan chaur, visitors take the old forest track to Mailani and enjoy the sight of deer grazing in the grassland, a Tusker peeling the bark of trees or an occasional encounter witha bear or Leopard. This small FRH named after the Malani sot (stream) offers one of the most picturesque surroundings and a quiet ambience. This is one of the best site for a peaceful stay and enjoying bird watching. The chances of spotting sloth bear are high in these forests. They are attracted by both termites and the sweet nectar of Mahua flowers. The bears have been recorded in intoxicated state when the Mahua ferments in their digestive system. Reptiles seen in this region are the Indian Python, Cobra, Krait and the fearsome King Cobra and different species of Lizards. 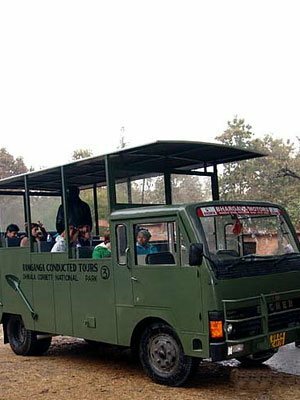 The Bijrani Day Safari zone of Corbett Tiger Reserve remains open for tourists from 15th October to 30th June. Night stay in Bijrani Eco-tourism Zones is allowed from 15th November to 14th June. The entry gate to Bijrani zone is Aamdanda gate, which is about 2 km. away from Ramnagar. After entering through Aamdanda gate, you cross about 5 km. of buffer zone before reaching the core area of Bijrani Eco-tourism zone.